Pochard (Aythya fuligula). Male. Taken at Slimbridge, Gloucs., on January 18th 2018. Male. Taken at Slimbridge, Gloucs., on January 18th 2018. Pochard (Aythya fuligula). Female. Taken at Tophill Low, East Yorks, on June 7th 2008. Female. Taken at Tophill Low, East Yorks, on June 7th 2008. 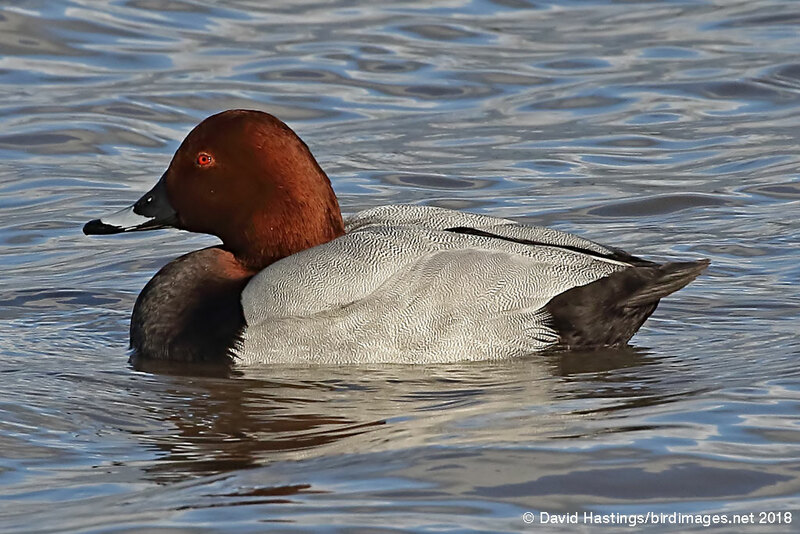 The Pochard is a stocky diving duck. The male is pale grey with a rusty red head and neck, and a black breast and tail. The female is brown with a dark head and blotchy cheeks. It breeds in eastern England and lowland Scotland, and in small numbers in Northern Ireland, with numbers increasing, perhaps helped by the creation of more gravel pits and reservoirs. Its breeding habitat is eutrophic lakes and marshes with sufficient open water at least 1m deep. British breeding birds disperse in winter, some to Europe, and many birds move here in winter from northern and eastern Europe. Over 85000 birds spend the winter here. This species has amber status on the British list, owing to the small breeding population of around 500 pairs.